Paint a rainbow…. or maybe your corporate colours! 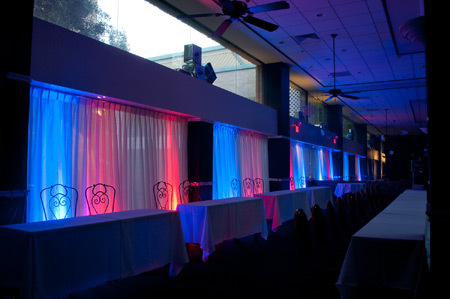 We offer full room uplighting packages, tailored to the specification and size of your room. With any particular theme in mind we can paint your room in vibrant light, with an expressive reign of control over the colour. The theme of the event is pinks and blues – we can do that too! Nothing is beyond the realm of possibility in colour for our lighting bars. Ask for a quotation on uplighting your venue!